NEW ORLEANS — This week’s batch of National Athletes of the Week might be the best yet when it comes to what they accomplished as a whole during competition in NCAA and NJCAA Indoor Track & Field. These eight athletes, as named Tuesday by the U.S. Track & Field and Cross Country Coaches Association (USTFCCCA), blistered the track and tested the limits of the throwing arcs. 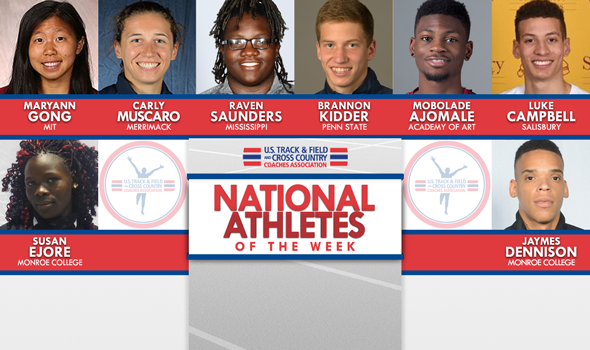 National Athlete of the Week is an award selected and presented by the USTFCCCA Communications Staff at the beginning of each week to eight collegiate indoor track & field athletes (male and female for each of the three NCAA divisions and the NJCAA). Penn State senior Brannon Kidder turned the Horace Ashenfelter III Indoor Track into his own personal playground this past weekend at the Penn State National. Kidder ran twice — once as the anchor on the Nittany Lions’ Distance Medley Relay and then again on Saturday in the 800 — and shined each time. During the DMR, Kidder used a strong kick to come from behind to beat Stanford’s Sean McGorty. Kidder split 3:55, which helped Penn State not only win the race but move up to fourth on the all-time collegiate chart. Then in the 800, Kidder went up against one of the strongest fields of the weekend and won by .36 seconds. Kidder’s time of 1:47.01 is third on the National Descender Order List for NCAA Division I and first in the Big Ten. What’s two-word combination is the exact opposite of “sophomore slump?" The answer: Raven Saunders. As phenomenal as her two-NCAA-title 2015 frosh campaign at Southern Illinois was, it seems her 2016 season at Ole Miss may be even more special. The South Carolinia native made history this past weekend at Vanderbilt as she launched the shot a whopping 18.98m (62-3¼) to move to No. 3 on the all-time collegiate performers list with the fifth-farthest throw ever by a collegian. She won by nearly half a meter over Jeneva Stevens, who occupies the No. 9 spot on the all-time U.S. indoor performers list — a list Saunders, herself, missed by just six centimeters. She topped 18 meters three times this weekend, bringing her season-long 18m+ total to eight. No one else in the NCAA has broken that barrier so far in 2016. To boot, she also threw a career-best 20.22m () in the weight throw to move to No. 16 in the country in that event. She’ll look to become just the third collegian to surpass 19 meters or even chase the collegiate record of 19.22m (63-¾) as soon as this coming weekend at the Notre Dame Meyo Invitational. Talk about getting your collegiate career off to a fast start. Two weekends ago, Ajomale debuted by winning the 200 at the Ed Jacoby Invite in 21.24 for the No. 2 spot on the 2016 DII descending order list. He one-upped himself this weekend by winning both the 200 and the 60 – the latter in his collegiate debut for the event. He ran 21.34 for 200 meters, but really made waves in the shorter race with a 6.65, putting him just .01 outside the all-time top-10 performers list in DII history. Among all collegians in 2016, Ajomale is tied for 12th in the country at 60 meters. Quarter-mile specialist Muscaro has been unstoppable in 2016 in whatever distance she runs. She’s notched individual wins this year at – in chronological order – the 500 (which put her less than a second outside the all-time college top-10), the 800 (for what was then a DII leader), the 60, and finally this weekend the 400. She dominated the John Thomas Terrier Invitational field in the 400, coming out on top of the 142-woman field in a scintillating 52.83. Not only does that time give her the 2016 DII lead, it makes her just the second woman in NCAA DII history to run faster than 53 seconds during the indoor season. Only Lorraine Graham of Lincoln (Mo. ), way back in 1997, has run faster at 52.22. Among all collegians in 2016, she’s ranked No. 3 as one of just six women below 53 seconds. Salisbury senior Luke Campbell doesn’t lack confidence when he sets foot on a track to compete in a hurdles race. After all, Campbell is a two-time defending national champ in the 400-meter variety of the event. As it turns out, Campbell isn’t too bad without hurdles in his way either. This past weekend at the Patriot Games, hosted by George Mason University, Campbell ran NCAA Division III’s top time in the 400 (49.07) — which came moments after he solidified his spot atop the National Descending Order List in the 60 hurdles (8.04). On the track at the John Thomas Terrier Invitational this past weekend, MIT’s Maryann Gong left no doubt that she is the class of distance running in NCAA Division III. Running in the fast heat of the 5000 in the meet hosted by Boston Univeristy, Gong placed fourth in 16:32.44. That mark stands as the second fastest time ever ran indoors in that event by a DIII female athlete (UW-Oshkosh’s Christy Cazzola holds the current record of 16:21.49). Gong now sits atop the leaderboard in the 3000 and 5000. Monroe College sophomore Jaymes Dennison was better. Gordon, the 2012 Olympic bronze medalist in the 400, competed at the John Thomas Terrier Invitational this past weekend in the 500. So did Dennison. Running in the second fastest heat of the afternoon, Dennison clocked a 1:02.07, which topped Gordon’s time of 1:03.13 in the fast heat. Dennison is now the NJCAA national leader in the event and shattered the previous school record. This past weekend at the John Thomas Terrier Invitational, Monroe College freshman Susan Ejore placed third out of 137 runners in the 800, beating talented athletes from all NCAA divisions and several professionals. Ejore’s time was 2:07.32. When you couple her 800 time in Boston with what she’s done this season so far, Ejore now has the top-ranked NJCAA times in the 800, 1000 and 3000, while she currently sits second in the mile.